Center for Research and Training in the field of Information and Communication Technologies (ICT) Center for research and training – ICT is a modern laboratory center with the most contemporary computer equipment in R.M and abroad. It is intended for scientific research work and training for realization of laboratory practical hours. Laboratories are used from undergraduate and postgraduate students and students at doctoral level. Undergraduate students use this center for realization of practical hours and projects for the courses. Students at master and doctoral level use this center for different projects and scientific-research work. The Center is composed of eight laboratories (with 25 working stations): 1. Programming and Information Systems 2. e-Technologies 3. High Performance Computing and Control Systems 4. Networks and Distributed Systems 5. Multimedia Systems and GIS 6. Operating Systems and System Software 7. IT skills/Microsoft Laboratory 8. e-Education and Digital Library Six of them are with Sun Ray 2 clients and two with PC computers and the total capacity is 200 working stations. For realization of laboratory practical hours at disposal are 16 servers with Sun Fire technology (X2200 M2, 4 core processor, 8 GB RAM, 2?250 GB disk space), 2 servers with technology Sun Enterprise (T5120, 6 core processor, 16 GB RAM, 2? 146 GB disk space), one data storage server Sun Fire (X4500, 2 processors with two cores , 16 GB RAM, 24 TB disk space), and one high performance computer with 8 processors with 4 cores (SunT4600 M2, with 8 processors with 4 cores, 64 GB RAM, 4? 146 GB disk space). 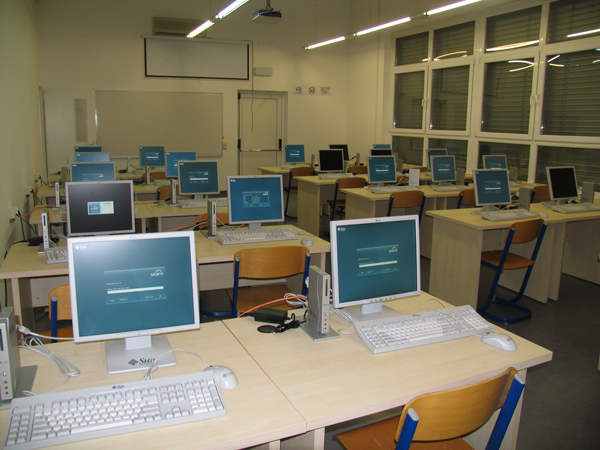 All these computer equipment is linked with sophisticated 1 Gbps net with 3COM and Cisco technology. Regarding the software, the equipment uses different operative systems such as: Sun Solaris 10, Windows (Xp, server 2003, server 2008), and Linux ERH 5. Applicative packages that are mainly used are: Sun, Microsoft, Oracle and many Open Source and Free License software packages that are compatible for realization of study programs and projects.